Gowans Stadium is a facility newly renovated with a much-needed increase in seating capacity, new entrance gates, public restrooms, locker rooms, and concession areas. With the extensive renovations to and modernization of Gowan's Stadium, it is now an outstanding venue for a wide variety of events. Of course, first and foremost it is a football field -- home to the Blue Dragons and the Salt Hawks, state 6A champions the past six years. Gowans Stadium is also host to an annual State High School Football Championship game, normally played the Saturday after Thanksgiving and The NJCAA Football Salt City Bowl played the first Saturday in December. 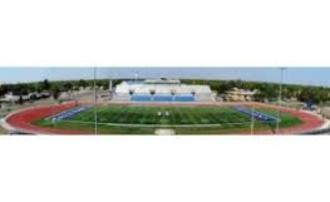 Annual NJCAA Salt City Bowl will be held in the 5,000 seat Gowans Stadium. Kickoff at 1 p.m.